I am Praveen and I here fundraising for my colleague and team mate, Santhosh Kumar. Santhosh kumar is 29 -year-old. He met with a tragic accident on December and is currently undergoing treatment in Sims Chellum Multispeciality Hospital, Hastampatti, Salem 636007. His condition is critical. He has multiple fractures in his face and severe head injury and depressed fracture in skull. He will need multiple surgeries to get back on his feet. The cost for which is nothing less than 10 lakhs. Santhosh being the sole bread winner of his family, piling medical bills are worrying his family. The office insurance is covering minimum amount of his medical expenses. Therefore, with this fundraiser we want your support to get him back on this feet. Contribute to save Santhosh. Estimated cost for the treatment provided by Dr. Prem Prakash. Sorry to say! Santhosh is again hospitalized. He has admitted again in SIMS CHELLUM on January 2018 for keeping plate in his head. While operating Doctors came to know that, the inflow and outflow of the fluid which protects the brain is not functioning properly. Hence hole is made in his throat and tube is kept for proper flow. Santhosh is unconscious till date. Still 2 more surgeries are pending for his recovery. 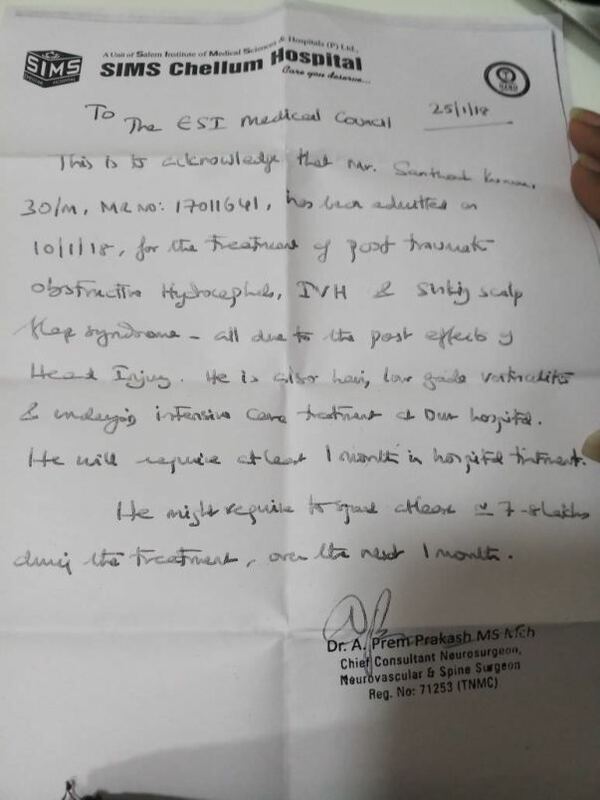 Financially it's very hard for his family since hospital and medical expenses have crossed 10lacks till date(15 Feb, 2018) and remaining 2 surgeries and hospital bill may exceed 15lacks. Santhosh family used all the possible sources of money, borrowed money from friends and relatives and available credits and now looking for our support again. Yes! 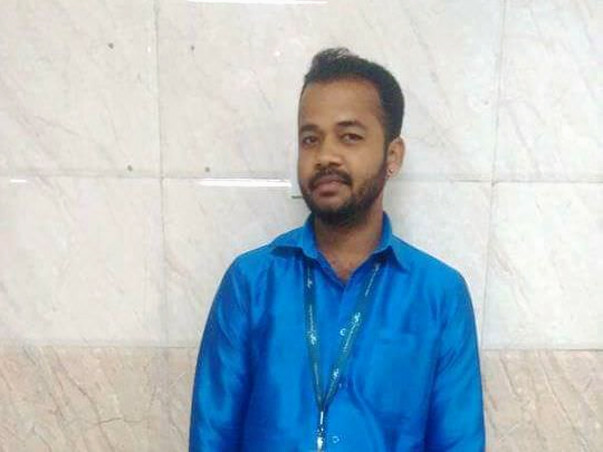 It's time for us to unite our hands to support Santhosh, Fighting for his life. 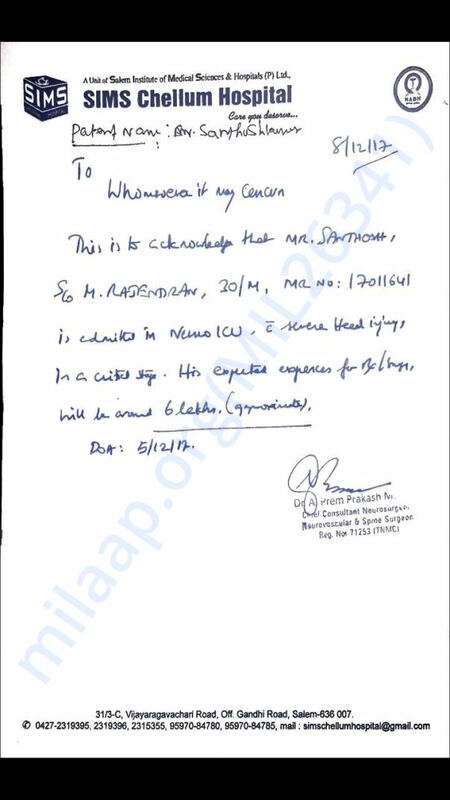 We kindly request you all to support and pray for Santhosh and his family to save him. Any amount you can manage to donate will be a life support for him. Please share this campaign to all friends and relatives to reach more people. Santosh fully out of danger and he is now conscious. He is gradually recovering. This would not have been possible if not for all your blessings and support. Thank you all once again. Do pray for his health and speedy recovery. Once again we thanks you all. Will keep you posted. With all your constant support and continuous prayers, I am now sharing a good news about Santhosh. YES! he is now completely out of danger zone. He is still under ICU, he is conscious, is stable. But doctors assured that this is curable; he can recover completely within few months. He is not able to speak now and not responding to our comments. It will take another few weeks for him to respond. This good news wouldn’t be possible without you and your prayers. I request you to kindly share this information with your friends. It’s all because of you! He has now come back. Keep Sharing #SaveSanthoshkumar and Do support! Please keep him in your prayers for his complete and speedy recovery ! !